If we took a time machine back to 1976, what would we see? For starters, the Apple Computer Company was launched, the CN Tower was completed and the movie Rocky was released. That same year, twin sisters Jean and Jane Ford from humble Indiana founded the fun and kitschy Face Place boutique in San Francisco’s Mission District. They haven’t looked back since and The Face Place was rebranded in 1990 to today’s much-esteemed Benefit Cosmetics. Flouting cheeky product names, Benefit has amassed a loyal following among beauty and lifestyle bloggers. Their very first product, now called Benetint, remains one of my favourite staples. Last month, Benefit relaunched their trusty line of concealers amidst a highly controversial ad campaign. I was sent a fabulous array of goodies to test drive: the new Boi-ing Airbrush Concealer, Boi-ing Brightening Concealer, BrowVo! Conditioning Primer and Goof-Proof Brow Pencil. Benefit also included a super-cute water resistant pouch, great for toting to the beach. I’ve included before-and-after photos to provide comparison on how effective these products are. Many Benefit junkies may have paid a visit to the cosmetic counter to find that their favourite concealers have been discontinued. Shocker! Rest easy, makeup mavens – this is not case. Benefit has updated their concealer line and encased them in nifty packages, resembling pencil/eraser motifs. They’ve also been rebranded and swept under the popular Boi-ing family. The Original Boi-ing formula is now called Industrial Strength Concealer and still delivers the brand’s tried and true full coverage. Fake-Up, the sheerest and most lightweight of the original lineup is now rebranded as Hydrating Concealer. A fan favourite, Erase Paste is now Brightening Concealer. Touted as the go-to product to banish dark circles, dull under-eye discolouration and general imperfections, this full coverage cream blends easily to a powder finish, with a slightly brightening effect. I use a sponge on makeup products to keep them sanitary. I applied Brightening to my left eye and am pleased with the coverage and “pick up” that the melon undertones provided. Unfortunately, only a bit more sleep will help with the puffiness under my eyeballs. This cream is heavily pigmented so a little goes a long way. I found it wore well through the day and didn’t cake like drier concealers can. It’s also great for application along the laugh lines to perk them up. This product is not good for where there’s a gathering of fine lines because the dry finish will exaggerate these features. To tackle that dilemma, read on. A new addition to the Boi-ing family is the Airbrush Concealer. This medium-coverage product provides a softer, more natural look as well as being waterproof — a must-have for sticky summer months! I applied Airbrush to my right eye and immediately fell in love with its lightweight texture. The coverage is buildable so I had to add a few more strokes to ward off those dark circles. This product is also awesome at smoothing out fine lines and slight discolourations while giving a soft, blurred finish. The creamy consistency melts into the skin. The only drawback with the new Boi-ing family is that the shade range is limited to three: light, medium and tanned. Porcelain ladies and dark beauties are out of luck. At CDN $27, Benefit concealers are on par with other premium brands. In 2003, Benefit fuelled the cosmetics industry’s obsession for eyebrows with the launch of their first Brow Bar inside Macy’s. They offer a collection of 16 unique products, some with several shade variations, all focusing on the arches above the eyes. The packaging is bright and fun, with the pizzazz of a carnival magic act. Presto! I’ll be the first to admit I have unruly, unshapely brows, which I am afraid to pluck too often, lest I end up with baldy brows! Thus, I was eager to try the BrowVo! Conditioning Primer. Used on its own, the clear gel serum smoothes and conditions brows with nutrient-rich keratin and soy proteins. The product promises to make brows thicker, healthier and fuller. Although no such results were evident in my seven-day trial (I wore it overnight as a conditioner) I liked how it tames flyaway hairs and extends the wear of other brow makeup. The soft applicator has a twist and click mechanism but it did not work very well for me. Either too much product came out, or not enough. A simple squeeze tube might have been better, although the silver packaging has wow-factor. Some of you may be put off by the CDN $38 price tag and consider this product a luxury extra. The Goof-Proof Brow Pencil makes the brow routine a breeze for both beginners and experts. The non-sharpen diamond head tip is so versatile! You can draw lines of varying thicknesses, shape brows and fill them in quickly. The consistency and pigmentation are perfect for building your arches just the way you like them. Once your sketches are complete, turn the pencil over and uncap the attached spoolie to blend, blend, blend! My first attempt was passable, not a total disaster but super-quick! I can use some more practice but this easy-glide pencil is a dream to work with. The 12-hour waterproof formula had amazing staying power, especially when paired with the BrowVo! Primer. Retailing at CDN $32, the Goof-Proof Brow Pencil is a worthwhile splurge for anyone looking to save time and hassle. 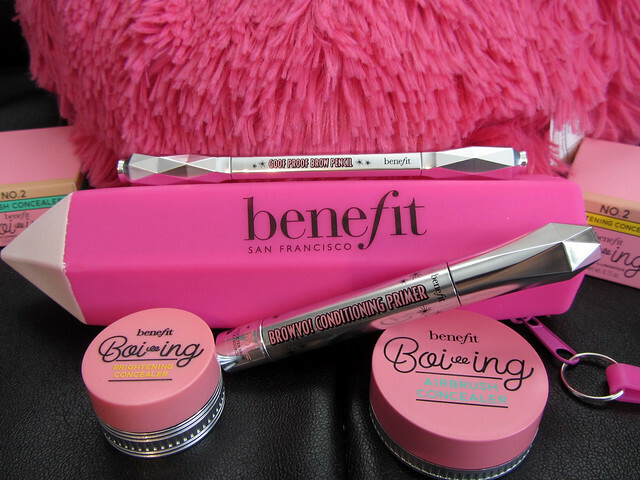 Overall, the Benefit products performed very well. I’m not the selfie type but took one to show what these products can do. I’m only wearing the Airbrush Concealer, Goof-Proof brow pencil and a touch of Benefit’s BADgal mascara. Benefit Cosmetics are available online, at Sephora and many other local beauty counters. I was sent the above products for this feature. Opinions, as always, are my own.